VW is ready to shift its focus to electric vehicles. One of the world’s largest carmakers is going all-in on electric vehicles. According to a Reuters story, Volkswagen’s strategy chief, Michael Jost, told attendees at the Handelsblatt automotive summit conference on Tuesday that the company will launch its last generation of gas-powered cars in 2026. After that, he said, it will focus on EVs. The announcement is one more sign of VW’s commitment to cleaning up its environmental act. In November 2017, it announced plans to spend $40 billion on EVs and hybrids in the hopes of becoming the world leader in electric mobility by 2025. Currently, it sells just one all-electric vehicle, the e-Golf, but the company already has several others in the works, with plans to roll those vehicles out beginning in 2020. Of course, perhaps no other automaker has as much need for a rebranding as “environmentally friendly” as VW — in 2015, officials caught the carmaker cheating on diesel-emissions tests, resulting in billions of dollars in fines and a landslide of negative press. Still, even if VW’s focus on clean transportation is part of some PR strategy, does it really matter? 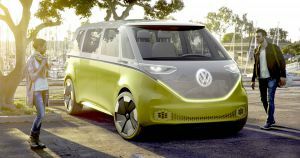 Vehicle emissions are contributing to our climate woes, so if VW wants to be the company to take the lead in ridding the world of gas-powered cars, more (electric) power to them.